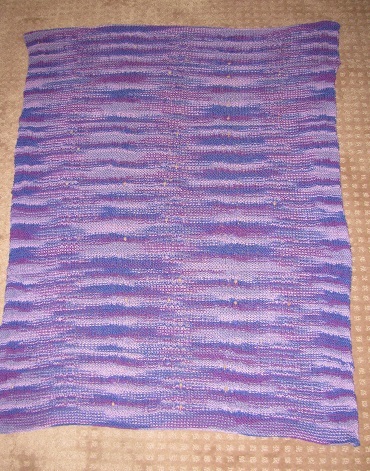 Sonderbooks » Blog Archive » Another Coded Blessing Blanket! I finished another Mathematical Knitting Project! This is another Coded Blessing Blanket. This time, though, it’s for my 22-year-old son. Blue Blankie is the blanket I knitted him when I was expecting his birth and I was on bed rest. After he was born, I gave him the blanket every time I fed him. I was happy when he took Blue Blankie with him to college, but yes, sadly, Blue Blankie is falling apart. However, Tim said he’d like a purple blanket this time. And I’d already used the same pattern to knit a blanket for my niece Alyssa with a blessing coded in the stitches. So I decided to do the same for Tim. Here’s how it works. 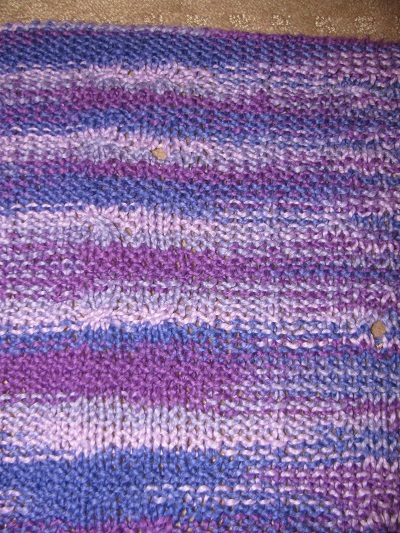 The stitches make a sort of plaid pattern with knits and purls. The pattern has a sequence of 12 rows that make one large pattern-row. Each pattern-row has seven smooth panels on the front side of the blanket. And each smooth panel is split into two parts. So I used those panels to code words of seven letters or less. The code I used was base 5. So A = 01, B = 02, C = 03, D = 04, E = 10, F = 11, and so on. So I only need 5 stitch patterns, using three stitches. I used some simple patterns. 0 is knit each stitch. This matches the background. 1 is purl each stitch, making a bumpy row. 2 is a cable made by holding 2 stitches to the back. 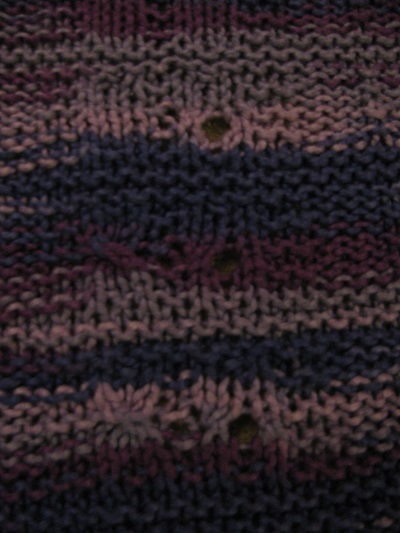 4 is a yarnover and knit 2 together — making a hole. Here’s a closer look at how the stitches turned out. And an even closer look. I’m not going to tell what the rest of the blanket says, except to say it’s a blessing. Can Tim read the code? Now, this is exactly the same way I made Alyssa’s Blessing Blanket, but it turned out that hers had an error. I had almost finished Tim’s at Christmas time, but finally proofread it — and found an error, took out about 50 rows, and reknitted them. But now it’s done, and it’s error-free! And it was a wonderful thing to knit a blanket full of love for my 22-year-old son who had just moved to the other side of the country. This entry was posted on Saturday, March 11th, 2017 at 9:54 pm and is filed under Knitting, Mathematical. You can follow any responses to this entry through the RSS 2.0 feed. You can leave a response, or trackback from your own site.